Designed as a durable, rugged alternative to standard Micro-USB cables, this Micro-USB to USB cables feature a stainless steel flexible wire that prevents tangled wires, and offers superior bendability, coupled by protection from normal wear and tear due to its stainless steel design. The connector housing is also made with metal, providing additional protection from plugging / unplugging. Take it with you on-the-go and never worry about accidental breakage. 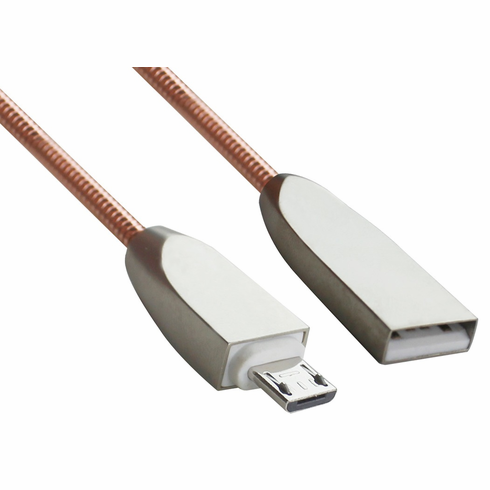 The Micro-USB to USB A cable allows you to plug in your Micro-USB devices, such as smartphones, tablets, and more to standard USB A ports, such as hubs, chargers, or the ports on your computer / laptop. To create a cable that wouldn't break due to the daily stresses of plugging in / out or taking with you on-the-go, a stainless steel flexible hose was put around the cable. This helps to prevents breaks and allows you to bend the cable without causing problems. An all metal connector housing on both sides provides extra protection and durability from plugging in / out.